But how does Instant Profit Sites really works? How about learning to make money the real way? In this review, I will reveal the truth about this system and if in fact, you can make $1,000 per day starting today. If you are on my website today, it’s the result of research you did prior to buying this product and I would like to congratulate you in doing so. You can never be too careful when buying these kinds of systems that make very bold promises. I can tell you right from the start that there are many red flags that came up when I watched the sales video, and that there is something very fishy going on here! If you are looking for a way to make money online, I invite you to check my method. You can get a starter membership absolutely free that will give you 10 free lessons on how to build your online business, along with 2 free websites that are yours to keep. NO credit card required. Click on the link below and start right now! Owner: “Jake” Nothing anywhere on the Internet about a Jake owning this system. Right away when I started watching the sales video, I knew that this was again one of “those” systems where they promise you that you will be rich in no time without any efforts on your part and this with an all-done-for-you system. The first thing that “Jake” says is that he has created an online business for you. Now, pardon my being so bold but, and I’m not sure how you see this, but does he think we are that dumb? How the heck is he going to create an online business with a simple video??? But that’s not all, we are making money while watching!!! You can call me suspicious if you want, but this is a no-brainer for me! This kind of statement is an insult to people’s intelligence! There is absolutely no truth in this at all, it’s simply a pure lie! 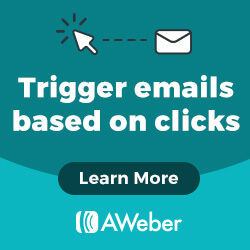 How could anyone make money just landing on a sales page? It just boggles my mind how unscrupulous and dishonest the people behind this system really are!!!! But to get back to the actual sales video, Jake claims that his system has made him $10 million in 4 years and that he wants to share the wealth with you now. You know that anyone can use a photoshop software and change any figures from a website right? Anyway, he says that the internet is full of scam artists and that is why you haven’t made any money yet! Now, he’s supposed to do all the work for you, and let you copy his exact website that has made him a fortune so you can sit back and relax while you make money with his system. Then he shows “Jay Watkins” from Clearwater FL. He supposedly has joined his system three days ago and Jake already transferred $500 to his PayPal account. Jay Watkins is a “Stock Image” that I found on Media Bakery’s website. So he does exist but his name is not Jay and he has NOT been transferred $500! This is completely FAKE! Then he goes on and on about how his system will do all of the technical work for you and basically don’t have to do any work and that you will be able to make $1,000 per day easily. From what I had seen so far I knew that this was just simply a tactic to get people that are anxious and desperate to make money to get in and purchase his system. By the end of the video, he shows another snapshot of the “account” that he has created for you and it now shows that you have made $175. And he urges you to “Grab it before somebody else does and steals your new account”. Yeah right! Oh, and you have to pay a fee of $37 to gain access to this account that has $175 in it?? But is it really there? Can you really make $138 right away just by watching a video? The easy answer is NO! And by the way, if you want to access the system, you will be asked to pay $97, not $37! A “Rip off” right from the start! They give you a price in the sales video but charges $60 more!!! If you are like me and you are tired of Fake testimonies and empty promises, check out my method of making money online. Its absolutely free to join and they will provide you with 10 free lessons and 2 websites to get you started. First, there is no way this system works like the spokesman says it does. You just can’t copy a website and expect to have the same results. Everything that is said in the video is all hype anyway! There is also the fact that the search engines (Google, Bing, and Yahoo) really don’t like duplicate content, so copying would not work! The concept is that they are supposed to provide an “all-done-for-you” affiliate marketing website, which would be ready to generate $1,000 per day right away. But the reality is that the website that they provide is a one-page site that is not original and these kinds of sites are just ignored by the search engines! So if you want to have any traffic at all, you will have to buy your traffic, either through paid advertising or solo ads. Something else I noticed while watching the sales video that it does not mention the name of the system once during the whole presentation. I saw this before, and it wasn’t called Instant profit sites it was called Profit with our sites and before that, it was Your Dream Website and the Easy Internet Plan. Absolutely nothing. This is one of the worst systems I have reviewed and seen! Period! Or should I say these are the worst systems since all of them are the same! Creating a false “online business” in the sales video making believe that your account has $175 in it! Fake Testimonies – They take stock images and create a testimony out of nothing! Unrealistic Income Claims – You will not make $1,000 per day with this! Claims Of Automation – Sorry but there is not one system out there that is fully automatic and makes you money while you do nothing, it simply doesn’t exist! The Disclaimer – They say it themselves that the “typical purchaser does not make money using this system” – See Conclusion! Hiked up the price from $37 to $97 in the checkout page – Rip off from what they say the price is and what it actually is! Obviously, I did not purchase this system as there are way too many red flags and it’s just plain to see that it would have been just a waste of my time trying to get my money back. They even left the old name “Easy Internet Plan” in the disclaimer. Another proof of a rehashed system. I DO NOT RECOMMEND THIS SYSTEM! I will even go as far as giving it 0 out of 10. There is absolutely nothing in here that will help you make money online! If you are interested in learning how to make extra money online and you are willing the necessary effort and time required to succeed, well, there is a real way to create your own successful online business. My No. 1 recommendation will provide you with all the training, tools and support you will need to make your first dollar online. It’s the same platform I used to create my own successful online business. If you understand that making money online takes work and time, just like any other methods to make money offline, then you will stop wasting your precious time and money on systems that are just get-rich-quick methods that simply don’t work. That being said, my method is very newbie friendly. When I started, I thought I knew about Affiliate Marketing, but soon realized that I was missing a lot of important pieces of the puzzle. I found and learned about those missing pieces but following their step-by-step training and I am now the proud owner of a successful online business! 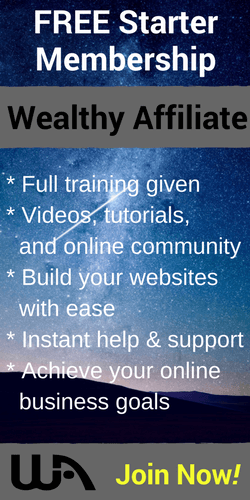 We, at Wealthy Affiliate, are over 1 million members strong. That means that it works! 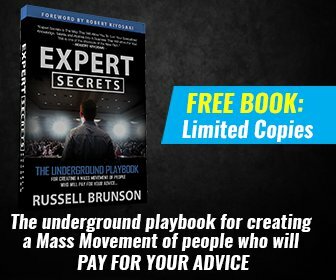 If you would like to learn more, I invite you to download my FREE guide. I wrote this guide to show how Affiliate marketing works and how I make money while I sleep! Download your FREE copy HERE NOW! Education, Websites, and Expert Help. When you join, you will have access to all three and also my personal support. I will be there for you every step of the way!